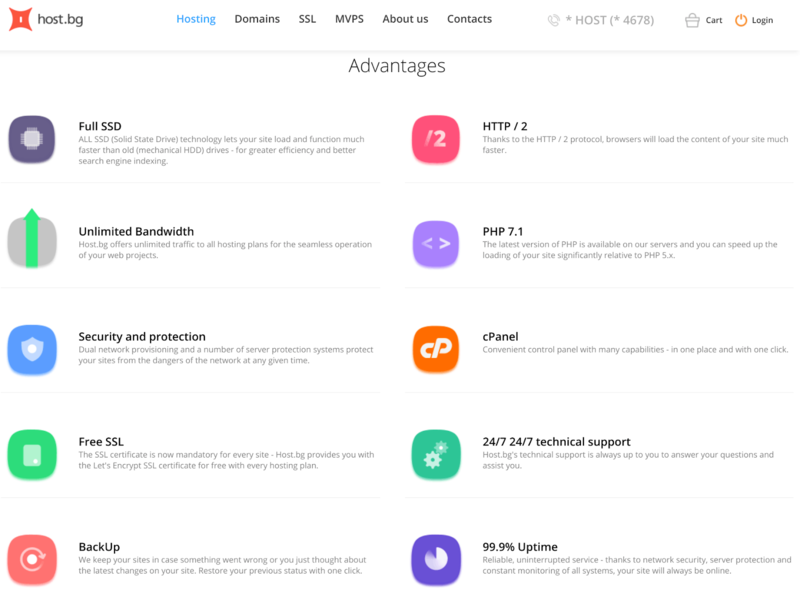 Host.bg Review 2019: Is Host.bg a Good Hosting? Established in 2003, Host.bg is a web hosting provider based in Bulgaria. The vendor offers SSD hosting solutions to over 50,000 websites and it targets small and medium-sized businesses in various countries across Europe. Bulgaria-based web hosting provider Host.bg was founded in 2003 as a hosting vendor for services such as shared hosting, SSL certificates, domain names, and managed VPS solutions. The vendor is in the list of the ten biggest web hosting companies in Bulgaria by market share, and it runs entirely on SSD disks. It targets small and medium-sized businesses in Bulgaria, but it also has a significant presence in Guernsey, Romania, Italy, and the United Kingdom. The Host.bg website is only available in Bulgarian. Host.bg offers shared hosting as well as managed VPS solutions. Hosting plans run only on SSD servers to ensure fast page loading for all the websites they host. The managed VPS solution includes all the shared hosting features, but websites under this plan are located on separate independent virtual servers. This VPS solution also includes backup space where you can save archival copies of your website which can easily be recovered if you want to return your website to a previous state. Host.bg uses dual network provisioning as well as several server protection systems to protect the websites they host from potential attacks or failures that would result in downtime. Host.bg uses the popular and easy-to-use cPanel control panel, which means that even novice webmasters can easily navigate this vendor’s user interface. Their website is also well organized and extremely easy to navigate. Compared to other web hosting companies in Bulgaria, Host.bg’s hosting plans are competitively priced in Bulgarian lev. You get a significant discount when ordering a hosting plan for 12 months or more, and you’re not taking too much risk because they also offer a 30-day money-back guarantee. Host.bg offers free Let’s Encrypt SSL certificates with all its hosting plans, and adds a free RapidSSL certificate for the first year for users who subscribe to their premium shared hosting plan. Though they offer an uptime guarantee of 99.995%, they do not have a refund policy in the event that the downtime falls below 99%. Customers can get in touch with Host.bg’s 24/7 support team via their telephone number, email, or live chat. They have no ticketing system but they do provide rapid responses to issues. The team is also quite knowledgeable and professional, and they have a fairly detailed knowledgebase on their website that includes an FAQ section and video tutorials. Host.bg appears to have the hosting infrastructure and expertise to host small and medium-sized businesses in Bulgaria and beyond. The absence of dedicated server plans is the clearest indicator that the vendor does not (yet) have the capacity to host big and complex websites for large corporations. Wondering how Host.bg stacks up against other Web Hosting companies? Enter any other Web Hosting company and we will give you a side-by-side comparison.